With nearly 1,800 participants, the Catholic Youth Organization has concluded a successful season of track and field. The season’s culminating meets, the Roadrunner Championships, for third and fourth graders, was held at La Salle Catholic College Preparatory last month. 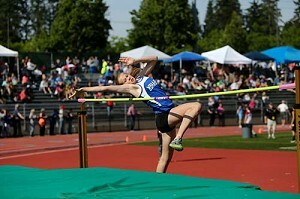 The Meet of Champions (MOC), for 5th and 8th grade athletes, was held at Jesuit. Both meets witnessed excellent performances from athletes. All told, the program has almost 300 coaches, representing 22 teams from Vancouver to Oregon City, Hillsboro to Gresham. The teams are: All Saints (AS), Cathedral (CATH), Christ the King (CTK), Franciscan Montessori Earth School (FMES), Holy Family (HF), Holy Trinity (HT), The Madeleine (MAD), Our Lady of Lourdes-Vancouver (LRDS), Our Lady of the Lake (OLL), Pacific Crest Academy-Camas (PCA), St. Andrew Nativity (SANS), St. Anthony (SANT), St. Clare (SCL), St. Ignatius (SIG), St. John the Apostle (SJA), St. John Fisher (SJF), St. Joseph-Vancouver (SJV), St. Matthew (SMAT), St. Pius X (SPX), St. Thomas More (STM), Valley Catholic (VC), and West Hills Christian (WHC). The developmental meet season has four meet locations with 250-450 athletes. 1. Keziah Hollands, SANS, 13.63. 1. Keziah Hollands, SANS, 28.86. 1. Molly Grant, SJF, 1:04.64. 1. Chloe Foerster, SPX, 2:28.21. 1. 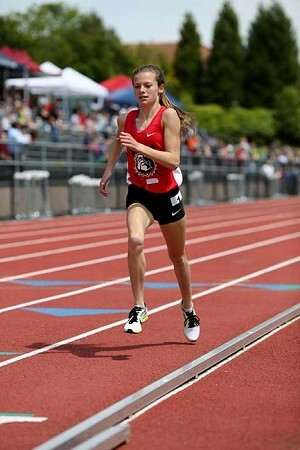 Chloe Foerster, SPX, 5:04.41. 1. Kelly Park, Holy Trinity, 11:32.31. 1. St. Pius X ‘A’ 57.48. 1. St. John Fisher ‘A’ 4:31.59. 1. Lily Reynolds, SJF, 4-05. 1. Kate Collins, Holy Family, 14-09. 1. Abigail Sheets, SIG, 27-09. 1. Josie Napoli, SJF, 79-05. 1. Zoe Zurasky, OLL, 13.18. 1. Zoe Zurasky, OLL, 26.99. 1. Greta Anderson, STM, 1:00.00. 1. Ember Stratton, SPX, 2:21.38. 1. Makenna Schumacher, STM, 4:49.69. 1. Makenna Schumacher, STM, 10:10.46*. 1. Our Lady of the Lake ‘A’ 53.17. 1. Valley Catholic ‘A’ 4:20.39. 1. Kate MacNaughton, VC, 5-00. 1. Alyssa Hughes, SCL, 15-05. 1. Ava David, OLL, 37-09.50. 1. Morgan Kirnak, SPX, 116-05. 1. James Menor, CTK, 12.74. 1. Michael Brittingham, STM, 26.34. 1. Denzel Pinto, SPX, 56.90*. 1. Jeffery Rogers, SANT, 2:24.68. 1. Jeffery Rogers, SANT, 4:54.36. 1. Luke Horne, Holy Trinity, 10:22.78. 1. St. Pius X ‘A’ 54.20. 1. St. Thomas More ‘A’ 4:20.31*. 1. Michael Brittingham, STM, 5-00. 1. James Menor, CTK, 16-04. 1. James Menor, CTK, 37-10. 1. Jeffery Rogers, SANT, 113-01. 1. Blake Deringer, PCA Knights, 11.99. 1. Blake Deringer, PCA Knights, 23.93. 1. Blake Deringer, PCA Knights, 53.36. 1. Ethan Reese, SPX, 2:10.18. 1. Ethan Reese, SPX, 4:33.72. 1. Cole Grieb, SANT, 9:49.72. 1. St. Matthew ‘A’ 47.57. 1. West Hills Christian School ‘A’ 3:59.26. 1. Aidan Maloney, SMAT, 5-05. 1. Jayden Holgado, SMAT, 18-10. 1. Lane Marshall, SJA, 46-11. 1. Joe Nizich, SJA, 170-01. 1, Gabrielle Jones, St. Pius X, 15.19. 1, Eva-Simone Grunkemeier, St. Pius X, 32.15. 1, Gabrielle Jones, St. Pius X, 1:10.75. 1, Kate Peters, Holy Trinity, 2:52.97. 1, Kate Peters, Holy Trinity, 5:37.22. 1, St. Pius X ‘A’ 1:03.17. 1, All Saints ‘A’ 39.69. 1, Annika Chu, St. Pius X, 12-04.50. 1, Julia Mindt, Our Lady of the Lake, 20-10.50. 1, Kate Peters, Holy Trinity, 73-02. 1, Kaden Huppin, St. Pius X, 15.04. 1, Malcolm Grant, St. Thomas More, 31.60. 1, Luke Warner, Franciscan Montessori E.S., 1:09.94. 1, Mario Oblad, Valley Catholic, 2:38.26. 1, Mario Oblad, Valley Catholic, 5:18.16. 1, St. Thomas More ‘A’ 1:01.20. 1, Christ the King ‘A’ 39.07. 1, Finbar O’Brien, St. Ignatius, 13-00.50. 1, Trace Cancelosi, SANT, 25-03.75. 1, Cade Collins, Holy Trinity, 99-08. The writer is CYO Track & Field Director.